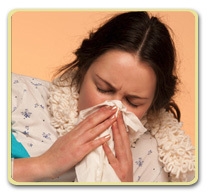 There's no denying that the typical symptoms of the common cold---sore throat, runny nose, cough, etc. ---are miserable. But when you realize that cold symptoms are an indication that your body's defense system is working, it gives you a different perspective on your misery. Up to 50% of colds are caused by a class of viruses known as rhinoviruses. Typically the virus enters its victim's body through the nose, either by contaminated fingers or droplets produced by coughing or sneezing. Once inside the nasal passages, the virus reproduces rapidly with cold symptoms beginning as soon as 12 hours after exposure to the virus. Symptoms usually peak after 2 to 3 days, and in most cases, resolve after a week. When the body is infected by a cold virus, the immune system is activated to fight the infection. Initial responses of the immune system are to send white blood cells to the site of the infection and to release chemicals known as inflammatory mediators, including "kinins". These inflammatory mediators cause tissue swelling, increased blood flow to the nasal cavities, and the production of mucus---many of the features that we identify as "cold" symptoms. Recently, an antiviral compound known as "viperin" has been identified that also plays an important role in fighting rhinovirus infections. These and many more responses from the immune system are essential in helping us get over a cold. Scratchy or sore throat: This is frequently the first manifestation of a cold. It is thought to be caused both by damage to the mucosa from the virus as well as by inflammatory mediators that come in contact with sensitive nerve endings. Mucous drainage: Initially, the watery drainage is thought to come about from inflammatory mediators, such as bradykinin. The thicker, discolored drainage is related to mucocilliary clearance, an important defense mechanism in which mucous is produced to help transport infecting organisms out of the body. Cough: This is also thought to be a component of mucociliary clearance. Movement of hair-like structures (cilia) lining the respiratory tract and coughing help to move virus-containing mucous out of the lungs. Stuffy nose: Blockage of nasal passages is a common feature of most colds. One of the inflammatory mediators in particular (bradykinin) is known to bring about increased blood flow and leaking of blood vessels leading to this symptom. Some medical writers have reasoned that the more severe the cold symptoms one is experiencing, the stronger the body's immune system response. This is perhaps a poor consolation to feeling so uncomfortable, but just remember that along with these symptoms comes the knowledge that your body is doing its best to fight the infection.